Francis George Claudet is responsible for the rarest coins of British Columbia--a mere handful of precious silver and gold $10 and $20 coins that were minted in 1862. Born in London in 1837 and educated in England and Germany, Claudet came to B.C. as chief assayer under Captain William Gosset in response to the gold rush on the lower Fraser River in the late 1850s. The influx of miners to the mainland not only created social and political problems for Governor James Douglas at Fort Victoria, it gave rise to a practical monetary problem for people on both the mainland and the island: how could they convert their gold dust into currency? Douglas wrote to Britain for help. Upon his arrival at Fort Victoria, Francis George Claudet was sent sent by Douglas to San Francisco in 1861 to buy coin-making machinery. He returned with dyes for new British Columbia coins that were cast by Albert Kuner in San Francisco. 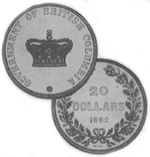 By June of 1862, at the assayer's office in New Westminister, some coins were minted with the words Government of British Columbia and a crown on one side, and $20 and the year on the other. These were used for an exhibition in London before Douglas changed his mind about the project. Only about a half dozen copies of these coins are known to exist. The Provincial Archives has a set and the $10 gold coin that Premier John Robson liked to carry on a watch chain. Other sets are owned by the British Museum, the Bank of Canada and the Canadian Imperial Bank of Commerce. Collector Sid Belzberg of Toronto has a set; King Farouk of Egypt once owned one coin. When plans for the New Westminster mint were abandoned, Claudet became assistant commissioner of lands and a coroner in 1871, then a stipendiary magistrate in 1872. R.L. Lewis gathered the letters of Claudet and Gosset to chronicle the attempt to create a mint at New Westminster for a publication in 1896. Claudet returned to England in 1872 and died in 1906. In 1958, as a Centennial project, Robert Reid and Takao Tanabe of Vancouver reprinted 275 copies of Claudet's advice in his 32-page pamphlet on Gold, its properties, modes of extraction, value etc. [BCBW 2004] "Early B.C." "Gold" "1850-1900"